Sylvie...she looks fabulous...I love these images and you have really made her look hot and wonderful.Would be a great 'guy' card. 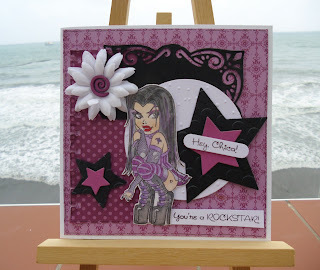 Great card Sylvie, love the image and fab colour combo. Hi Sylvi! Love the image and the colour you've used. really a great card for a teemager! Hi Sylvie. Your card is amazing. Love it. Thank goodness we're back up and running Sylvie! The Rich Razzleberry and black looks all moody and dramatic - just right for a teenager! fantastic card sylvie.i love the image and your colours and design are stunning.